I have a choice between creature lagoon or fun house witch one do think is the better game. CFTBL. Beautiful game. Lot going on...Rudy freaks me out. BUT Creech is probably my favorite. I bought both, did high end restorations on both...Sold the Funhouse and still have the Creature! Theme and play was better on CFTBL. Creech for gameplay in my collection...both great games. Both are AMAZING games. Definitely a hard decision. I would almost have to go for Creature... Although I own and love Funhouse and haven't yet owned a Creature. Either would be a nice addition to your collection. Creature is my favorite, ever. You've already got a Pat Lawlor (Twilight Zone), so you might want to mix it up and find out what John Trudeau is all about. A little more food for thought: the multiball on Creature is the best I've ever played. I've read that it was originally designed as a three ball multiball (indeed, the machine has three balls, even though it clearly only needs two), but was later reduced to two - a decision I fully support. Starting the mutliball requires focus on four things (F-I-L-M), and completing all four is exactly as difficult as starting a multiball should be. Once you start it, you're not flailing wildly like multiball on most games, you're totally in control: focused on every shot you make with both balls. You know exactly what you're trying to do and if you're succeeding or missing. Jackpots and super jackpots (multiplied 4x if possible) are where all of the points are at, and although it's so simple, it's magnificently difficult to do. That's elegance defined. If you took the glass off of a Creature and cheated, you could blow away every high score in just a couple minutes. Getting the big points is SO simple, yet so difficult. I think that alone is what makes the game so magnificent. Oh, not to mention the best art package and best sound package in the game. A little more food for thought: the multiball on Creature is the best I've ever played. I've read that it was originally designed as a three ball multiball (indeed, the machine has three balls, even though it clearly only needs two), but was later reduced to two - a decision I fully support. 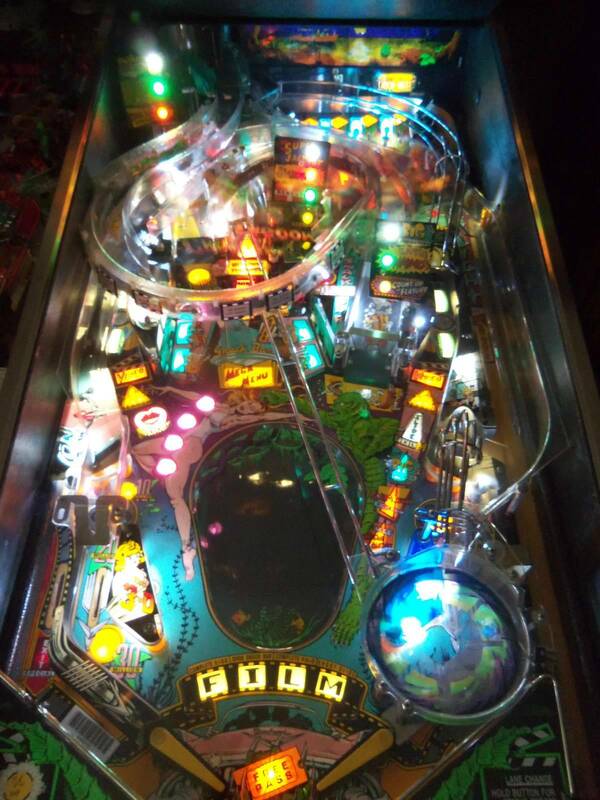 Starting the mutliball requires focus on four things (F-I-L-M), and completing all four is exactly as difficult as starting a multiball should be. Once you start it, you're not flailing wildly like multiball on most games, you're focused (pun) on every shot you make with both balls. You know exactly what you're trying to do and if you're succeeding or missing. Jackpots and super jackpots (multiplied 4x if possible) are where all of the points are at, and although it's so simple, it's magnificently difficult to do. That's elegance defined. Nice post! I very much agree and I'd also go with CFTBL. However, if Funhouse was in super shape and Creature was a beater--I'd probably take FH. Looking at your collection, I am going to say FH. I own both... it would be a hard decision for me. I love the art & music of Creach. On the other hand; FunHouse is just plain fun. I love the way Rudy taunts you thu out the game. Its a tough call. If I had to decide to let one go, it would be Creature, by a very slight margin. Both great games, I own a creature and my dad has a funhouse. I really love both but I like creature better. Even though the multi ball is only 2 ball, it's extremely challenging. Creature has great ramps and is a dmd game. If you are into modding, tons of mods for creature. You can't go wrong either way though. Is the likelihood that there will be a FH 2.0 a factor in your decision? I would love to own a Creature, so there is my vote.